You created some items and you want to box them? Nothing difficult or worth bothering. Easy as making a smile. 1. Be sure you are located in a place where you can create. You can't built everywhere you like. Must be a place where building is allowed, a must for step two, so focus on finding the right place first. 2. Right click on ground, select create and a window will pop-up. You can see a line of different tabs in the middle and a bunch of shapes on the upper window part. Choose the shape you prefer and click on ground to make it appear. 3. Go to GENERAL TAB. Here you can rename your box, edit description, set permissions and also set the price if you mean to sell it. Be sure to check what means original, copy and contents before you start to sell. 4. 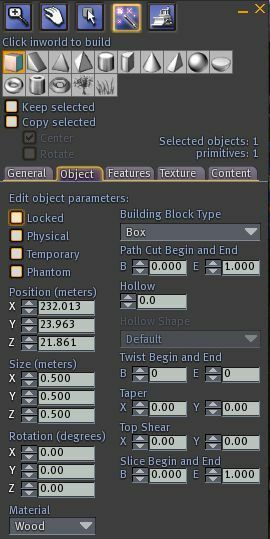 Under OBJECT TAB you can change the look of your box. Play with the arrows and remake it as you like. You can change position, size, rotation you can also twist it if you want, or make a hole in it. Just let your imagination go. 5. 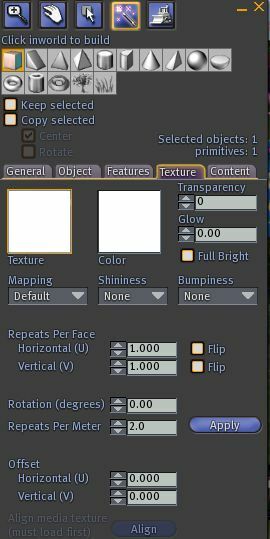 Go to TEXTURE TAB. Click on the left square and select a preview picture of your creation. 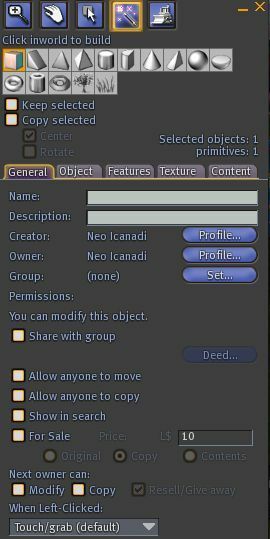 Make sure you created one first and also already uploaded in-world. Once selected you can change colors, make it lighter or darker, rotate, make it transparent etc. 6. Finally you finished editing the appearance of your box. It's still empty tho. Open your inventory and search your creations. Check again permissions of your items ( go to properties ), and be sure everything is fine. 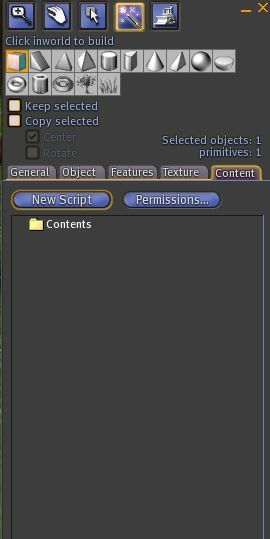 Go to the CONTENT TAB, select the desired creations from your inventory and put them in the content tab window. Automaticly the creations are transfered there, boxed all together and prepared for you to sell or give away.